Similar to these, were the Secret Seven books, though the setting of these was more rural, with the lead pair living on a farm. These children were younger, and their adventures seemed more juvenile, so they were the first books one tired of. 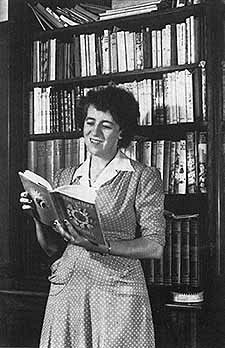 I fear then that I remember little of them, except for an unusual tale involving the stealing of pets, though again that series is mentioned most frequently by those who belittle Blyton’s achievement, as though anchoring her in simplicity was the key to belittling her. So too she is often referred to as famous for her stories about girls schools, St Claire’s and the slightly more developed Malory Towers. But these, though enjoyable enough, were also limited in their scope, with much emphasis on midnight feasts and lacrosse matches and japes in the classroom. For me, now, Blyton’s greatest strength lies in the Famous Five series, where the four children (and Timmy the dog) explore various parts of the country, and discover all sorts of mischief which they deal with superbly. The series began with three children visiting their uncle who is a distinguished scientist with one child called George, who turns out to be a girl who resents the restrictions of her gender. She owns a small island, given to her by her father when she was young, but which he now wants to sell. Her cousins, whose visit she had initially resented, help her to save the island by discovering its secret, and from then on the group go away on all sorts of exciting holidays, hiking, caravanning, to stay at farms near experimental aircraft stations and at seaside resorts which are haunts of smugglers. My affection for Enid Blyton redoubled when I first got to England and found the landscape familiar entirely because of her books. The Cornish coast, the Welsh mountains, the moors of Devon, the rolling downs of Oxfordshire, had all been brought alive previously as the Five wandered through them. Fascinatingly, they had begun their adventures in 1942, when the war was raging fiercely, and it was clear, whatever the outcome would be, that the world had changed beyond recognition. I suspect then that Enid Blyton’s relentless evocation of the British countryside, beginning then and going on for twenty years more, as Britain declined and lost its empire, was an exercise in nostalgia that understandably added to her appeal. So too, even as the welfare state flourished and class barriers came crashing down, she celebrated self-sufficiency through her resourceful youngsters, all emphatically middle class, going away to public schools and always conscious of their status, even if conscientiously charming to those less fortunate than themselves. And yet, at the same time, there was also in Enid Blyton a streak of the unorthodox, which I suspect is why she was able to affirm her generally elitist outlook so convincingly. The other series, for which I had always had a soft spot, though it had too few books to wallow in it over endless school holidays, was about Barney, a circus boy who is befriended by a middle class family. Barney is on a quest for his father, a rich man who had married a poor circus girl who had then left him, taking away her infant son. She dies, leaving him alone to work in a circus, but he continues to look for his father as she had urged. In the last book of what was meant to be a four book series, Barney finds him and is taken in to a prosperous lifestyle. In extending the series in response to appeals however, while Blyton set the fifth book in the father’s palatial country house, the sixth and last was called The Ragamuffin Mystery, and introduced another poor boy. So too Blyton had an enormously successful series about a Circus, an institution she uses as a symbol of liveliness in many books. It is true that sometimes the Circus seems dangerous, with some unpleasant people, even if they are not crooked, but by and large it is the devil-may-care approach of the circus people that Blyton celebrates. She has a Circus recurring in another series that was less well known when I was a child, the ‘Secret’ series, which was particularly unorthodox, involving children running away from home and hiding out in the countryside, where they are befriended by a less respectable boy called Jack. When they finally settle down in a happy settled home, along with Jack, they engage in adventures that take them to a Ruritanian Eastern Europe (where the circus turns up to help them) as well as to the Atlas mountains. A similar series was the ‘Adventure’ one, which also involved lots of travel, to Africa as well as the distant Hebrides, where spies exchanged secrets on isolated islands. These books, with their over the top approach to adventure, had preceded the comparatively ordinary adventures in the English countryside. Again, one would hesitate to pronounce definitively on the social significance of such shifts. But I do not think it entirely accidental that, with the onset of the War that was to transform Britain so conclusively, Enid Blyton began much more consistently to celebrate its basic attractions.